This is Anne…she was busy working at Cheltenham School of Complementary Therapy & Beauty when she started to feel unwell. Thankfully, a member of staff had attended Emergency First Aid at Work Training course in Gloucestershire. It was only a 1-day course, but it taught her what she needed in times of emergencies and she was able to help Anne. When Anne’s heart stopped, Ainsley knew exactly what to do and started CPR. She also asked another member of staff to collect a defibrillator and went on to set this up, to shock Anne’s heart into starting again. Would you be able to help Anne? Would anyone in your workplace know how to help you? 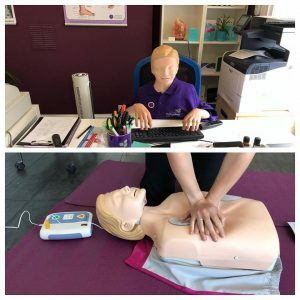 Learn how to save a life by booking into a First Aid course with Cheltenham School of Complementary Therapy & Beauty. We offer the 1-day course once per month. On successful completion, a certificate from the Awarding Body will be applied for. This certificate is recognised by the Health and Safety Executive and valid for 3 years. There is public parking in North Place, Cheltenham, Gloucestershire. We are in easy reach from Worcestershire, Birmingham, Oxfordshire and surrounding areas.